Spinal cord injury (SCI) can exacerbate the physical and physiologic declines—including in the musculoskeletal, cardiovascular, gastrointestinal (GI), pulmonary, and integumentary systems—brought on by the aging process. A number of long-term follow-up studies and many authors have documented the tendency for individuals with SCI to age faster than the able-bodied population does. That is to say, individuals with SCI develop characteristics and medical problems commonly associated with the aging process at a much younger age. The characteristics of aging have been well defined through the years. Menter and Hudson describe normal aging as involving 3 processes, all overlapping but distinctly different. These processes are (1) the physiologic changes of the body itself, (2) the individual's changing social roles, and (3) self-realization. This article focuses primarily on the physiologic changes in aging. As individuals age, they experience a variety of new and unanticipated issues. These may include medical, functional, socioeconomic, and support problems. Individuals experience changes and functional declines in all body systems as they age. The rates of decline vary from individual to individual, depending on genetics, body habitus, lifestyle, and general state of health. Williams and Hadler demonstrated that there is variation in the rate of decline for the different organ systems in the body. A report by Katzman did as well, illustrating the differing rates of decline between the pulmonary system and the peripheral nervous system; the study demonstrated a 60% decline in pulmonary function by age 80 years, as compared with a 15% decline in nerve conduction velocity. In the musculoskeletal system, a loss of calcium eventually leads to osteoporosis. Muscles lose strength and coordination, coordination and balance deteriorate, and joint capsules tighten, lose flexibility, and develop contractures. Lean muscle mass is lost and is replaced with adipose tissue. Eventually, a slender athletic build gives way to one that is overweight, with individuals developing a protruding abdomen and a somewhat stooped posture. Clark and Siebens summarized musculoskeletal changes as consisting of a decrease in muscle mass, muscle fiber size, and the number of myofibrils, along with a reduced concentration of mitochondrial enzymes. These changes occur regardless of an individual's level of activity. Muscle strength declines 20-30% after age 60, and maximum power output (the work rate) declines 45% after the fifth decade. Degenerative joint changes in weight-bearing joints essentially are a universal occurrence by age 60. The central and peripheral nervous systems also experience decline. Starting at age 24 years, neurons in the central nervous system are lost in a slow, steady decay process. Clark and Siebens also reported normal aging to include decreases in short-term memory, a loss of speed and of motor activities, and a slowing in the rate of central information processing. The peripheral nervous system experiences a decline in the connections and speed with which it can conduct messages. These declines result in decreased balance in strength, coordination, and agility. Between the ages of 25 and 75 years, physiologic changes in the neurologic systems include a greater-than 60% reduction in vibratory sense in the lower extremities and a greater-than 20% reduction in simple reaction time. The cardiovascular system loses capacity to pump blood through a decreasing stroke volume, as well as through the decreased ability to maintain vessel tone. Aging is associated with a progressive, gradual increase in systolic and diastolic blood pressures, likely related to a loss of arterial elasticity. An increased incidence of orthostatic hypotension exists, as does a greater incidence of syncope syndromes associated with micturition. The pulmonary system experiences a decreased compliance or elasticity of the lung tissues, interfering with the lungs' ability to expand on inspiration. In addition, the chest wall loses its flexibility and muscle strength, leading to a restriction of pulmonary function. Vital capacity, maximum voluntary ventilation, expiratory flow rate, and forced expiratory ventilation all decline with aging. In the GI tract, transit time increases, resulting in incomplete absorption of some medications and overabsorption of others; excessive water reabsorption due to the prolonged transit time can lead to a dilated or enlarged colon, rectal fissures, and hemorrhoids. A decreased force and coordination of smooth muscle contraction in the colon is associated with aging. Endocrine changes include a reduction of hormones, such as human growth hormones and testosterone, responsible for the repair and maintenance of cellular tissues. Reduction in the levels or the effectiveness of insulin and insulinlike growth factor also takes place. In general, as one ages, the cellular-mediated and humeral-mediated immune response systems become less effective. The integumentary system experiences a loss of subcutaneous supporting and adipose tissues, as well as thinning of the skin with loss of elasticity. Skin tears and bruising become much more common with age. The renal system loses functional units or glomeruli, which can result in some renal insufficiency. Incontinence is not considered a normal part of the aging process. Fortunately, all of the body's organ systems have a large functional reserve capacity. For most individuals, the natural decline in these body systems is only a minor nuisance or inconvenience until late in life. These levels of independence in ADL are in marked contrast to the level of independence of the average person with spinal cord injury (SCI). The individual with SCI typically is young at the time of injury and, as a result of the SCI, experiences an immediate reduction of some of the functional reserves and capacities that were present. As a result, he/she often requires assistance with ADL. Upper extremity pain is a common problem associated with spinal cord injury (SCI) and is most often due to either peripheral nerve entrapments or overuse syndromes. Subbarao and colleagues reported that more than 70% of individuals with chronic SCI report pain in their upper extremities. Most of these individuals require some sort of treatment for the pain or modification of their activities. The pain has been reported to increase with time after the onset of the injury. According to Kirshblum and coauthors, the most common overuse syndromes causing pain in the upper extremities are degenerative joint diseases, rotator cuff tears, rotator cuff tendinitis, subacromial bursitis, and capsulitis. Other musculoskeletal complications include fractures of the lower extremities, which reportedly occur in as many as 6% of individuals, with the most common fracture occurring at the femur. As many of 10% of these fractures result in nonunion. Nearly all pediatric patients with SCI experience scoliosis (97%), and just under half of all adults with SCI develop the condition. It has been demonstrated that there is a continual linear loss of bone that is a function of the time that has passed since the occurrence of SCI. This research was conducted on sets of identical twins in which one twin had an SCI and the other was able-bodied. Soft-tissue changes occur as a result of aging with SCI. The areas over weight-bearing surfaces (the buttocks) experience a loss or thinning of the subcutaneous tissues. This results in thinning of the skin and a loss of elasticity. These effects result in skin that is subject to breakdown and that has more difficulty healing once a pressure sore or ulcer has developed. The rate of decubitus ulcers increases with time after the onset of SCI. Bauman and coauthors also have described body composition changes that can be summarized as a loss of lean muscle mass and an increasing percentage of body adipose tissue that occurs as a function of time. [15, 18, 19] Most individuals with SCI experience weight gain that increases with time and that eventually results in a level of obesity that puts significant limitations on the patients' functional capabilities. Because of an ineffective distribution of oxygenated blood, individuals with SCI have reduced exercise tolerance. Venous return to the heart is limited because of a decrease in sympathetic tone and a reduction in the muscular pumping action of the lower extremities, leading to pooling. Homocystine levels have been reported to be elevated in men with SCI, and the levels increase with the duration of SCI. In addition, levels of prostacyclin receptor antibody increase with the duration of SCI; this, in turn, can result in platelet aggregation. GI complications in acute or chronic spinal cord injury (SCI) are numerous. Following chronic SCI, colonic compliance and motility decrease. Electromyographic studies have shown that basal colonic myoelectrical activity is higher in persons with SCI than it is in controls. Problems associated with GI tract dysfunction increase with age after SCI. Seventy-four percent of patients with SCI develop hemorrhoids, 43% develop abdominal distention, 43% experience autonomic dysreflexia related to the GI tract, and 20% develop difficulty with bowel evacuation. Following the onset of injury, the prevalence of GI complaints increases with time. Sixty percent of tetraplegic patients require assistance with managing their bowel routine, as do approximately 16% of paraplegic patients. The functional ability to manage neurogenic bowel incontinence can change as the individual ages or gains weight. The frequency of GI complications and problems is greatest in individuals aged 60 years or older or whose injuries are at least 30 years old. Frisbie and colleagues reported a higher-than-expected incidence of colorectal cancer in these patients. A greater frequency of bowel dysfunction is reported in individuals with SCI whose injuries are at least 5 years old. Declining pulmonary function can result from restrictive disease, obstructive disease, or a combination of these. In spinal cord injury (SCI), restrictive lung disease occurs as a result of respiratory muscle paralysis. The higher the level of SCI, the greater the restrictive impairment. The development of kyphosis, scoliosis, or increasing spasticity can cause further restrictive disease as the individual with SCI ages. Sleep apnea reportedly occurs in 40% of individuals with SCI. The frequency of obstructive sleep apnea increases with age. Of those individuals with SCI who experience sleep apnea, only 25% have been found to be obese. The long-term use of baclofen may be associated with the development of obstructive sleep apnea. Numerous endocrine changes have been described in patients with spinal cord injury (SCI). The rate of diabetes has been reported to be 4 times higher in SCI patients than in the general population. After glucose tolerance testing in SCI patients, 22% were found to have diabetes, with an additional 34% having impaired glucose tolerance. Bauman demonstrated abnormally low levels of human growth hormone and testosterone in individuals with SCI. Low levels of these hormones can result in a reduced capacity for cellular repair and can lead to a reduced capacity for maintaining lean muscle mass and strength. In addition, low levels of these hormones can prolong healing and soft-tissue repair following injuries. 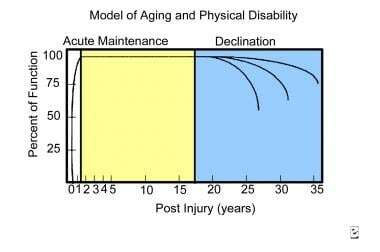 As previously mentioned, a number of long-term follow-up studies and many authors have documented the tendency for individuals with spinal cord injury (SCI) to age faster than does the able-bodied population. That is to say, individuals with SCI develop characteristics and medical problems commonly associated with the aging process at a much younger age. Some authors have provided assistance in helping to determine when these changes may occur. The acute restoration phase occurs immediately following SCI, with the individual going from having very little functional capability to regaining the maximum amount of functional return during rehabilitation. This phase is followed by the maintenance phase, which varies in length of time; in this phase, the individual with SCI can enjoy a relatively stable level of function. This period is followed by a predictable functional decline, which results from the degenerative effects of overuse syndromes and the physiologic aging process (see graph below). Model of aging and physical disability. A number of studies have validated the occurrence of this functional decline, which may begin as early as 10-15 years postinjury or as late as 20 years postinjury, depending on the patient’s particular set of circumstances. As noted before, Cushman and Hassett evaluated people whose SCI was at least 15 years old and found that 93% had experienced a decline in functional status by the time of the evaluation. One important thing to keep in mind is that not everyone who has SCI ages in the same way or at the same rate. A large number of factors are important to consider, including genetics, lifestyle, level of injury, age, weight, health history, level of supportive care, level of SCI, and comorbidities. The age of the individual at the onset of SCI is an important consideration in estimating the duration of SCI before functional decline begins. Kempt and his colleagues at Rancho Los Amigos developed a model for this factor. Younger individuals whose age at SCI onset is during or prior to adolescence may enjoy a maintenance phase of 20 years prior to experiencing functional decline, whereas individuals who are aged 55 years at the onset of their SCI may only have 5-7 years of relatively stable functioning status prior to experiencing a decline. 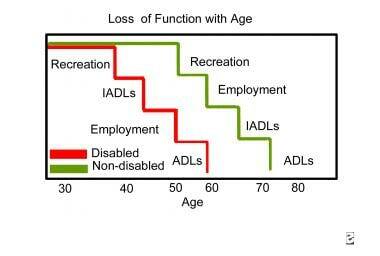 Thomlinson described functional declines in major life areas, such as recreation, independent ADL, and employment, in the disabled population, as compared with the general population. In each of these major life areas, the functional decline was experienced at a much earlier age in the disabled population than in the nondisabled population. A study by Liem and colleagues noted that with each passing decade, the odds that a person with spinal cord injury (SCI) will need more assistance with ADL increases 42%. The same study demonstrated that in a group of people who were 20 years post-SCI, 33% reported needing more assistance with ADL at 3-year follow-up. The ADL most affected were bathing, transfers, and dressing. Another researcher found that the IADL with which people with SCI needed increased help included household chores, shopping, and meal preparation. The most commonly cited reasons for needing more assistance with ADL or IADL are greater weakness, increased pain, and increased weight. In addition, the cumulative changes brought on by the number of years post-SCI had a greater effect on the need for assistance with ADL than did an individual's chronologic age. The graph below depicts loss of function with age. Loss of function with age. ADL means activities of daily living; IADL means instrumental activities of daily living. Cushman LA, Hassett J. Spinal cord injury: 10 and 15 years after. Paraplegia. 1992 Oct. 30(10):690-6. [Medline]. Smith AE, Molton IR, Jensen MP. Self-reported incidence and age of onset of chronic comorbid medical conditions in adults aging with long-term physical disability. Disabil Health J. 2016 Feb 18. [Medline]. Menter RR, Hudson LM. Spinal cord injury clinical outcomes. Stover S, ed. The Model Systems. New York, NY: Aspen Pubs; 1995. 272. Williams ME, Hadler NM. Sounding Board. The illness as the focus of geriatric medicine. N Engl J Med. 1983 Jun 2. 308(22):1357-60. [Medline]. Clark GS, Siebens HC. Geriatric rehabilitation. Rehabilitation Medicine: Principles in Practice. 3rd ed. Philadelphia, Pa: Lippincott-Raven; 1998. 963-95. Kennedy J, LaPlante MP, Kaye HS. Need for assistance in the activities of daily living [abstract]. Disability Statistics. 1997. 18:1-4. Kane RL, Ouslander JG, Abrass IB. Essentials of Clinical Geriatrics. 4th ed. New York, NY: McGraw-Hill; 1999. Hitzig SL, Tonack M, Campbell KA, et al. Secondary health complications in an aging Canadian spinal cord injury sample. Am J Phys Med Rehabil. 2008 Jul. 87(7):545-55. [Medline]. Subbarao JV, Klopfstein J, Turpin R. Prevalence and impact of wrist and shoulder pain in patients with spinal cord injury. J Spinal Cord Med. 1995 Jan. 18(1):9-13. [Medline]. Aljure J, Eltorai I, Bradley WE, et al. Carpal tunnel syndrome in paraplegic patients. Paraplegia. 1985 Jun. 23(3):182-6. [Medline]. Davidoff G, Werner R, Waring W. Compressive mononeuropathies of the upper extremity in chronic paraplegia. Paraplegia. 1991 Jan. 29(1):17-24. [Medline]. Kirshblum S, Druin E, Planten K. Musculoskeletal conditions in chronic spinal cord injury. Top Spinal Cord Inj Rehabil. 1997. 2:23-35. Morse LR, Nguyen HP, Jain N, Williams S, Tun CG, Battaglino RA, et al. Age and motor score predict osteoprotegerin level in chronic spinal cord injury. J Musculoskelet Neuronal Interact. 2008 Jan-Mar. 8(1):50-7. [Medline]. [Full Text]. Garland DE, Stewart CA, Adkins RH, et al. Osteoporosis after spinal cord injury. J Orthop Res. 1992 May. 10(3):371-8. [Medline]. Bauman WA, Garland DE, Schwartz E. Calcium metabolism and osteoporosis in individuals with spinal cord injury. Top Spinal Cord Inj Rehabil. 2:84-96. Szollar SM, Martin EM, Sartoris DJ, et al. Bone mineral density and indexes of bone metabolism in spinal cord injury. Am J Phys Med Rehabil. 1998 Jan-Feb. 77(1):28-35. [Medline]. Rossier AB, Favre H, Valloton MB. Body composition of spinal cord injured adults. The Spinal Cord Injured Patient: Comprehensive Management. Philadelphia, Pa: WB Saunders; 1991. 163-70. Bauman WA, Spungen AM. Disorders of carbohydrate and lipid metabolism in veterans with paraplegia or quadriplegia: a model of premature aging. Metabolism. 1994 Jun. 43(6):749-56. [Medline]. Bauman WA, Waters RL. Aging with a spinal cord injury. Kemp BJ, Mosqueda L, eds. Aging With a Disability: What the Clinician Needs to Know. Baltimore, Md: Johns Hopkins University Press; 2004. 153-74. Kocina P. Body composition of spinal cord injured adults. Sports Med. 1997 Jan. 23(1):48-60. [Medline]. Szlachcic Y, Carrothers L, Adkins R, Waters R. Clinical significance of abnormal electrocardiographic findings in individuals aging with spinal injury and abnormal lipid profiles. J Spinal Cord Med. 2007. 30(5):473-6. [Medline]. [Full Text]. Lavela SL, Evans CT, Prohaska TR, Miskevics S, Ganesh SP, Weaver FM. Males aging with a spinal cord injury: prevalence of cardiovascular and metabolic conditions. Arch Phys Med Rehabil. 2012 Jan. 93(1):90-5. [Medline]. Frisbie JH, Chopra S, Foo D, et al. Colorectal carcinoma and myelopathy. J Am Paraplegia Soc. 1984 Apr. 7(2):33-6. [Medline]. Dicpinigaitis PV, Spungen AM, Bauman WA, et al. Bronchial hyperresponsiveness after cervical spinal cord injury. Chest. 1994 Apr. 105(4):1073-6. [Medline]. [Full Text]. Bauman WA, La Fountaine MF, Spungen AM. Age-related prevalence of low testosterone in men with spinal cord injury. J Spinal Cord Med. 2014 Jan. 37(1):32-9. [Medline]. [Full Text]. Kempt B. Long Term Outcomes With Disability. Ranchos Los Amigos Seminar. 1998. Thomlinson J. Effects of Aging with Disability. Ranchos Los Amigos Seminar. 1998. Lombardi G, Macchiarella A, Cecconi F, et al. Sexual life of males over 50 years of age with spinal-cord lesions of at least 20 years. Spinal Cord. 2008 May 13. [Medline]. Duetsch EM, Sawyer H. A Guide to Rehabilitation. White Plains, NY: Ahab Press; 2000. Weed RO, ed. Life Care Planning and Case Management Handbook. 2nd ed. Boca Raton, Fl: CRC Press; 2004. Blackwell TL, Krause JS, Winkler T, et al. Spinal Cord Injury Desk Reference: Guidelines for Life Care Planning and Case Management. New York, NY: Demos Medical Pub; 2000. 161-8. Liem NR, McColl MA, King W, et al. Aging with a spinal cord injury: factors associated with the need for more help with activities of daily living. Arch Phys Med Rehabil. 2004 Oct. 85(10):1567-77. [Medline].